The ambient temperature in urban areas are higher than in suburban and rural areas, due to the ‘heat island effect.’ The lack of vegetation, use of high absorbing heat materials and high concentration of energy use are all characteristics of an urban area. These factors along with the high density of urban structures and buildings that absorb solar radiation, trap the heat. The effect of UHI show a larger effect to the temperatures at night than day as well as in the winter than in the summer. The absence of solar heating at night causes atmospheric convection to decrease, stabilizing urban temperatures; however, this stabilization forms an inversion layer trapping the urban air near the surface which exchange heat with the still warm high heat retention surfaces (Morris 2009). In attempt to cool down building interiors for thermal comfort, there has been a very significant increase in cooling energy. The increased use of air conditioners has a huge impact environmentally and as well as economically. Many studies have proposed mitigation solutions which include but are not limited to greening techniques, shading, wind corridors, and urban water bodies. This project will focus on replicating studies that have tested high albedo materials in building envelopes at a smaller scale. In conclusion, the adaptation of large-scale high albedo measures by using building materials with high solar reflectance can significantly reduce ambient temperatures. 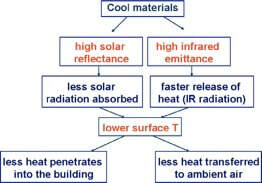 ​ Materials in the envelope of buildings absorb solar radiation and dissipate part of the heat through convection and radiative cooling, increasing the surrounding ambient temperature. 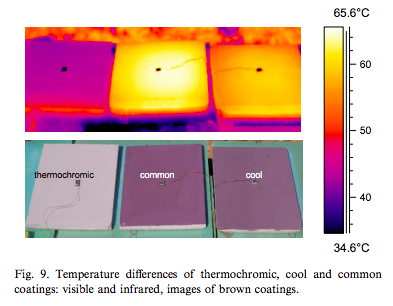 M. Santamouris proposed cooling materials of four different categories: (1) highly reflective and emissive light colored materials, (2) cool colored materials, (3) phase change materials, (4) dynamic cool materials. The first phase of his research showed that white materials present high reflectivity and emissivity, with white wool coatings having a superior thermal performance compared to natural white materials. The second phase indicated that cool colored materials have a higher reflectivity than conventional materials of the same color. With the incorporation of nanotechnology with high sensible heat or latent heat capacity into materials from phase two as a phase three were suggested. Santamouris warns that although highly reflective materials present a high cooling potential, they may increase heating needs. 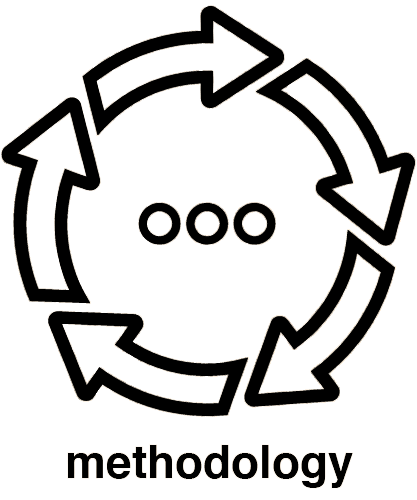 Therefore, testing materials with dynamic characteristics as phase four is needed (Santamouris, Synnefa, and Karlessi 2011). 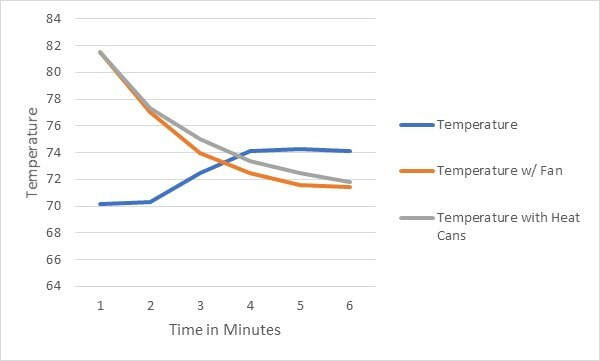 A. Kandya tested took another approach by using materials to increase interior space cooling in efforts to reduce the carbon footprint and help mitigate the UHI effect by reducing needs for air conditioning. He tested low albedo materials such as brick and concrete in comparison to materials such as Bamcrete (bamboo-concrete) and Rammed Earth. He measured the thermal performance of building envelope modifications like increasing the wall thickness and constructing a cavity wall. The study concludes that the use of bamcrete and increasing the thickness of the wall all helped decrease power consumption for cooling, with implementing a cavity having the greatest reducing effect (Kandya and Mohan 2018). Kandya, Anurag, and Manju Mohan. “Mitigating the Urban Heat Island Effect through Building Envelope Modifications.” Energy & Buildings 164 (April 2018): 266–77. https://doi.org/10.1016/j.enbuild.2018.01.014. Morris, C.J.G. “Urban Heat Islands and Climate Change - Melbourne, Australia",” March 10, 2009. O’Malley, Christopher, Poorang Piroozfar, Eric R. P. Farr, and Francesco Pomponi. “Urban Heat Island (UHI) Mitigating Strategies: A Case-Based Comparative Analysis.” Sustainable Cities and Society 19 (December 1, 2015): 222–35. https://doi.org/10.1016/j.scs.2015.05.009. Santamouris, M., A. Synnefa, and T. Karlessi. “Using Advanced Cool Materials in the Urban Built Environment to Mitigate Heat Islands and Improve Thermal Comfort Conditions.” Solar Energy 85, no. 12 (December 2011): 3085–3102. https://doi.org/10.1016/j.solener.2010.12.023. Synnefa, A., A. Dandou, M. Santamouris, M. Tombrou, and N. Soulakellis. “On the Use of Cool Materials as a Heat Island Mitigation Strategy.” Journal of Applied Meteorology & Climatology 47, no. 11 (November 2008): 2846–56. https://doi.org/10.1175/2008JAMC1830.1.